If you've never seen TotallyLooksLike.com, it’s worth checking out. Part of the Cheezburger network, it compares two pop culture images that look eerily similar. It's creepy and hilarious, but is lacking on the Mormon front. So I'm starting a series called Mormon Doppelgängers, which hopes to bring to light examples that are more relevant to our neck of the woods. Here's a few to get us started. Had to get this one out of the way. 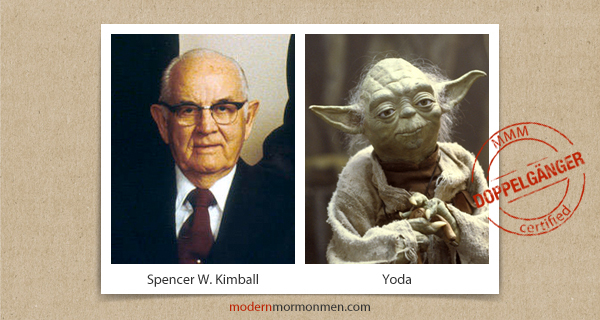 Rumor has it Yoda was actually modeled after our beloved prophet. Rumor has a lot of things that aren't true though. Still, with the voice, hair, ears, and overall cuteness, one has to wonder. You may remember James Cromwell from such films as Babe, L.A. Confidential, The Queen, or the 153 other movies and TV shows he's appeared in. Or maybe you only recognize him as Mr. Skolnick in the made for TV movie Revenge of the Nerds IV: Nerds in Love. More importantly, he looks a heck of a lot like our favorite swearing General Authority. The resemblance is so uncanny it makes me question my beliefs about reincarnation. 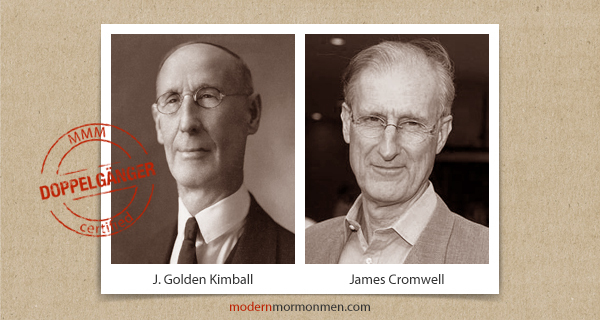 Elder Kimball died in 1938 and Mr. Cromwell was born less than two years later in 1940. Follow the logical conclusion, people. A beautiful mommy/lifestyle blogger and a beautiful Italian actress. Don't know who Valeria Golino is? Think harder. Think Rain Man, Hot Shots! (along with Hot Shots! Part Deux of course), and Big Top Pee Wee. She even dated Pee Wee Herman during filming. Design Mom a.k.a. Gabrielle Blair never dated Pee Wee (as far as we know). However, she is a pioneer, a trendsetter, and runs one of the most successful mommy blogs out there. 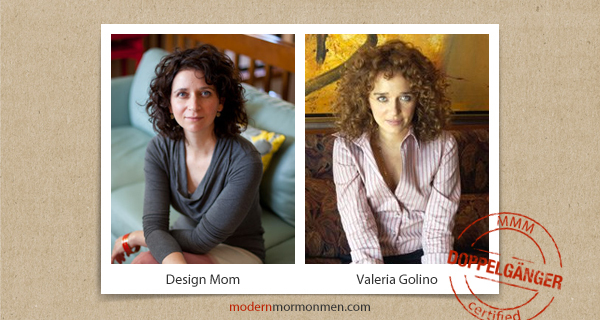 We're proud to claim her as one of our most creative Mormon icons. Images via here, starwars.com, here, here, justinhackworth.com, and IMDb. Please refrain from making any personal attacks on anyone featured. Cruel comments will not be tolerated. And yes, I realize the irony that the post itself could be considered a cruel personal attack. Want to submit ideas or images? Do it. This post was originally published May 3, 2011.